Christopher Dietrich has written an insightful and important investigation of the economic dimensions of anticolonial nationalism in the mid- and late-twentieth century. Rigorously researched and admirably fusing intellectual history with political economy, Oil Revolution focuses on the specific commodity of oil to chronicle the rise of the doctrine of economic sovereignty which, he convincingly argues, was central to anticolonial and postcolonial thought in the 1950s, 1960s, and 1970s. In certain respects, Dietrich uses oil to describe the developmentalist, redistributive agendas of the Group of 77 countries (G77) and the New International Economic Order (NIEO) in manner similar to those historians of capitalism who have focused on specific, revealing commodities – most notably cotton, perhaps – to describe a broader, systemic, and global phenomenon. There are profound differences, of course. First, Dietrich describes a failed attempt to create a new global economic order. Second, that attempt at global economic restructuring failed because oil was not at all representative of natural commodities produced by developing countries. On the contrary, Dietrich argues, the huge increases in world oil prices that certain, mostly Middle Eastern developing countries instigating in the early 1970s had a crippling effect on their oil-less peers across Asia, Africa, and Latin America. Not only did developing countries fail to create additional commodity cartels akin to OPEC, but OPEC’s success led directly to the schismatic bankruptcy of the Third World as a whole and the collapse of the NIEO agenda. In its broad strokes, this interpretation concurs with what appears to be the consensus narrative, that of the swift rise and precipitous fall of economic Third Worldism, its brief period of significant global influence in the early 1970s smashed a decade later by the prerogatives of neoliberal globalisation. I shall return to this narrative below. 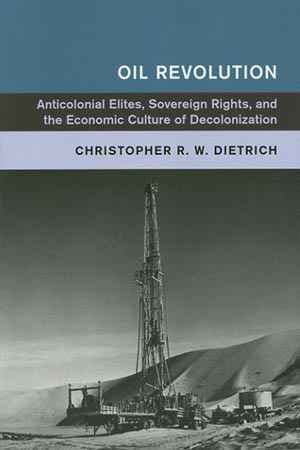 First, what I find to be the most brilliant contribution of Oil Revolution is its intellectual history of anticolonial and postcolonial economic thought, broadly speaking, and most especially its compelling depiction of the emergence of what Dietrich calls the “international class of anticolonial elites” (p. 9). The anticolonial (or postcolonial) elites that Dietrich examines are not so much those in the first rank of postcolonial political power, but more typically the wonks called on at independence to be the technocrats and senior civil servants of the new countries’ economics and energy apparatuses. As Dietrich emphasises, they generally boasted tertiary and graduate degrees from prestigious Western academic institutions. Urbane and professionalised, they personified the convergence of decolonisation and the expanding institutional international order. “Their lives,” he writes evocatively, “stretched from the classrooms and libraries of universities in London, Paris, New York, and Washington, DC to hallways and meeting rooms of the United Nations and OPEC to regional and international summits […]”(p. 7). Oil Revolution is a wonderful complement to those histories of anticolonial internationalism and Third World solidarity that are more concerned with protestors and guerrillas than lawyers and economists, for it underscores how decolonization was, amid the smoke and crowds, simultaneously an establishment-creating process of possibly unprecedented scale and pace. That said, despite its concern with, per the subtitle, the “economic culture” of decolonization, this book is not really a cultural history of its technocratic protagonists. Dietrich keeps his eye quite firmly on their professional and intellectual lives, and in doing so he highlights many of the underappreciated achievements of the Third World project. As anyone who studies postcolonial international history knows, the 1950s–1970s saw a bewildering proliferation of international organisations, meetings, and initiatives. It can be difficult enough just to parse the myriad highest-level heads of state summits that convened under the aegis of Afro-Asianism, Non-Alignment, Tricontinentalism, African unity, the G77, and so on. But each of those organizing themes generally also sponsored a further multitude of regular meetings concerned with subjects such as economics, technical cooperation, literature, women, and the like. Dietrich’s tremendous and meticulous research really shines here, unpacking many of the more obscure events as well as some of the big ones. He is able to show how these meetings facilitated real and significant exchange of ideas and technical knowledge. To that end, in addition to thorough trawling of American and British governmental records, the book especially profits from deep investigation of organizational records, such as those of the OPEC, the UN system, and the IMF. Dietrich has also explored numerous personal archives and official papers. As a result of this diligence, Oil Revolution provides a very rich and convincing intellectual history of decolonization and postcolonial cooperation, in the specific realms of economic theory and international law as they pertained to oil and natural resources. The core idea that Dietrich highlights is that of sovereign rights, and more specifically of “permanent sovereignty” as it relates to natural resources; that is, the principle that what lies in the ground of Iraq, say, belongs solely to Iraq. Sovereignty, of course, was and continues to be the most fundamental value of postcolonial politics, and this book is a powerful testament to that value’s expression in the economic realm akin to, for example, Samuel Moyn’s examination of its expression with regard to human rights. That said, Dietrich perhaps underemphasizes the point when he refers to permanent sovereignty as the “economic equivalent of decolonization” (pp. 21, 152); for in some cases, nationalization of national resources was the very point of political decolonization in the first place, and perhaps no better country than Iraq exemplifies how a certain economic resource can be the nation and country’s raison d’être. Even being focused on one particular domain of Third World cooperation and diplomacy, this book captures the spirit of “Third Worldism” better than all but a few others. For anticolonial elites, Dietrich points out, Internationalism and nationalism were fully complementary, even mutually constitutive (p. 153). It is not a debate that he engages in himself, but at a time when many scholars are calling for the minimalization of the state and national elites in postcolonial history, Dietrich’s intervention is proof that the political and intellectual history of the non-Western world remains a rich and underexamined subject that is relevant to us all. In the same fashion that some legal scholars in the 1960s concluded that decolonization “provincialized” the Eurocentric body of international law to that point (pp. 150–152, 155–157), Oil Revolution convincingly demonstrates that the history of the “Global South” is simply the history of the globe. Crucially, Dietrich properly conveys how these rather technocratic and theoretical exchanges were in fact very exciting to the participants, many of whom thereby became insurgents and revolutionaries in their own besuited and bureaucratic fashion (pp. 192–195). Arguably, his central muse is Mahmood Maghribi, a Libyan who studied law at George Washington University, worked for American oil firms, spent some time in the internationalist hothouse of Beirut, and then became the architect of Muammar Qaddafi’s revolutionary re-arranging of the global oil industry in the early 1970s. Through the likes of Maghribi and others, such as the Algerian lawyer Mohammed Bedjaoui, this book does a great service to the past by highlighting the exhilaration of anticolonial thought and action, even when it occurred in the realms of professional officialdom. With its chronological narrative proceeding from the early Cold War years to the mid-1970s, Oil Revolution shows how forceful Western interventions against Iran and Egypt in the 1950s overshadowed all subsequent debates of economic sovereignty and planning for the nationalisation of hydrocarbon resources. Ultimately, Dietrich’s view of postcolonial international affairs is an unsentimental, even jaded one. He deems the NIEO a failure, a “grand gesture […] splintered into nothingness” by its encounter with reality and the differences of self-interest between oil-rich and oil-poor developing countries. Third Worldism, he concludes, was an “unfounded solidarity” that merely reflected one fleeting moment in time (pp. 305–307). He does convincingly demonstrate that the establishment of the principle of sovereign rights was a significant and lasting accomplishment, but he also rightly suggests that the countervailing principle of sovereign debt proved to be more determinative of poor countries’ fates. Oil Revolution concurs with the standard narrative that Third Worldist economic agendas attained the appearance of real influence and viability in the early 1970s, only to be smashed by spiralling debt, structural adjustment, and neoliberal globalisation in the late 1970s and 1980s. One wonders to what degree this conclusion is a product of the book’s mid-1970s endpoint. After all, perhaps the early twenty-first century was neoliberalism’s apogee, akin to Third Worldism’s thirty years prior. The great reduction in oil prices in the 1980s, and fluctuations thereafter, brought some oil-exporting developing countries back into a closer alignment of interests with oil-less developing countries. With GATT and UNCTAD as dueling projects in the 1960s and 1970s, one direct and ongoing legacy of the G77 agenda is the stymying of the next round of world trade negotiations, due in particular to the concerns of countries such as Brazil and China. A still more recent legacy of Third World solidarity – one with direct bearing on energy concerns – is the structuring of the Paris climate accords. In many ways, the Paris agreements of 2015 reflected some of the basic debates of the Paris Conference in the mid-1970s. That said, I raise these contemplations not to challenge Oil Revolution’s contribution, but rather to emphasize it. It will be necessary reading on a host of subjects – oil, the Third World, the Cold War, and the postwar institutional international order, among others. Dietrich’s book is an extremely timely and perceptive intervention into perennially paramount dilemmas in global political economy. It is also an exemplary demonstration of how to proportionately (rather than merely polemically) “provincialise” the West in modern international and intellectual history. Samuel Moyn, The Last Utopia: Human Rights in History, Cambridge MA 2010; Samuel Moyn, Not Enough: Human Rights in an Unequal World, Cambridge MA 2018. For a concise examination of the theme of postcolonial economic sovereignty, see Vanessa Ogle, State Rights against Private Capital: The ‘New International Economic Order’ and the Struggle over Aid, Trade, and Foreign Investment, 1962–1981, in: Humanity 5/2 (2014), pp. 211–234. Jeffrey Byrne: Rezension zu: R. W. Dietrich, Christopher: Oil Revolution. Anticolonial Elites, Sovereign Rights, and the Economic Culture of Decolonization. Cambridge 2017 , in: H-Soz-Kult, 03.08.2018, <www.hsozkult.de/publicationreview/id/rezbuecher-27953>.